Yesterday Kenny and I took advantage of the nice weather and headed out to an area where we had not yet visited. The Seven Islands Wildlife Refuge is located off Kodak Road in east Knox County. 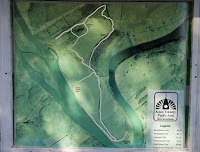 It is located on 364 acres of land on a bend in the French Broad River. It was formerly farm land, but is now owned an d maintained by the Knox Co. parks and recreation division. The white line on the map shows the route we hiked. We started by hiking up the hill on the Overlook trail. The grassy, mowed trail passes through an old pasture and follows a wood lot. We were much too late in the season to enjoy many wildflowers, but I did find a few goldenrods, a pur ple morning glory, a Jimsonweed, white asters, Smartweed, and a Ground Cherry. As we walked along the woodlot a deer bolted out and ran up the trail above us. I couldn't react fast enough to photograph her. Earlier I had seen some crows dive-bombing some branches on a tree on the hill. I noticed a flash of white that I assumed was a hawk. 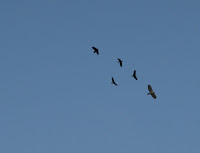 Suddenly the hawk took to the air with the crows in hot pursuit! It isn't hard to figure out why a group of crows is called a "mob" when you see action like this! The trails had numerous Bluebird houses and even a couple of bat houses on posts. They were well-protected against hungry snakes by sharp wire mesh and smooth plastic or metal cylinders. The tra il went down a steep hill and went to the bank of the French Broad Riv er. We were suprised at how swift the current in the was. Farther up the trail we enjoyed seeing a large rock bluff. Since the property had once been a farm, there are still old barns and even an old delapidated house remaining on the property. One barn houses t ractors and other equipment. The barns are decorated with large painted quilt squares, perhaps part of the Quilter's Trail. The mowed trail extends behind the barn. We were thrilled to see the spectacular red leaves of Winged Sumac against the yellow locust tree leaves. The brown stems of the grass added to the beautiful sight.